The research proposal defense is an oral examination administered by the candidate's Dissertation Committee. The purpose of the Research Proposal Defense is to test the validity of the dissertation proposal and the candidate's fitness to carry out the research work proposed. 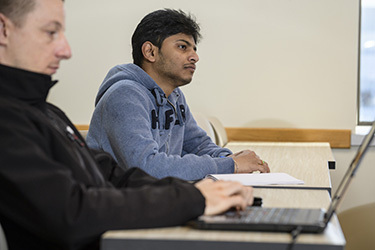 The examination may be taken no earlier than the semester in which the candidate completes the nine credits of coursework as required by the focus area. The candidate must have finished the Program Qualification and candidacy examination requirements. The candidate must complete and submit a Research Proposal Examination Request Form (PDF) to the Ph.D. in Engineering mailbox (207 Russ) no later than 30 days before the scheduled defense. The dissertation advisor and Program Director must sign this form. The format of the proposal must conform to the regulations outlined by the Graduate School in the Graduate Policy and Procedures Manual. The substance of this proposal forms a major part of the oral portion of the exam. As such, it must be a complete document with a thoughtful, in-depth treatment of the dissertation topic. It should be substantial enough to form the basis of a meaningful oral examination, establishing a worthy research problem and developing an effective research plan. It should only be written after the student has done enough work on the problem to speak meaningfully about it, including discussion of the preliminary investigations. Above all, it should be a technically sound and scholarly document. At least two weeks prior to the scheduled defense, the Research Proposal must be submitted to the candidate's Dissertation Committee. The candidate passed the Research Proposal Defense and may proceed to independent study and research for the doctoral degree. The examination is temporarily adjourned. The candidate must revise the Research Proposal and be examined again within the next six months. The candidate failed, but may submit a new Research Proposal and submit to another Research Proposal Defense after completing additional coursework, independent study, or research. Members of the Dissertation Committee must sign a Record of Research Proposal Defense Form. A copy of the signed form will be given to the student and dissertation advisor.